Every Saturday at 2 p.m., Eva Kotátková’s solo exhibition at Modern Art Oxford offered a nod to the city’s collegiate history: an old-fashioned lecture staged in a 1940s style classroom, with chalk scribbles over a blackboard, rows of wooden chairs and piles of worn-out books, including volumes by Charles Dickens, Honoré de Balzac, Jorge Luis Borges and Samuel Beckett.1 In this performance, a nervous yet determined scholar strives to finish his lecture despite a stream of sceptical laughter and shouts from accomplices interspersed amongst the audience. He sips some water and reads out: ‘a new literary form that will accommodate the mess incompatible with the picture of the world as an ordered whole and as a space for meaningful action’. His words accelerate, his voice grows louder as the audience becomes more agitated: ‘to find a form that accommodates the mess, that is the task of the artist now!’ Cynical bravos and unrestrained mocking erupt as the scholar rushes off the stage. To find a form that accommodates the mess, that is the task of the artist now! Reich’s ‘body armour’ renders visible tensions in the body caused by emotional blockages, which he believed led to personality disorders. Kotátková’s practice is similarly concerned with giving form to the psychology of restraint and experimenting with its many emotional reverberations. 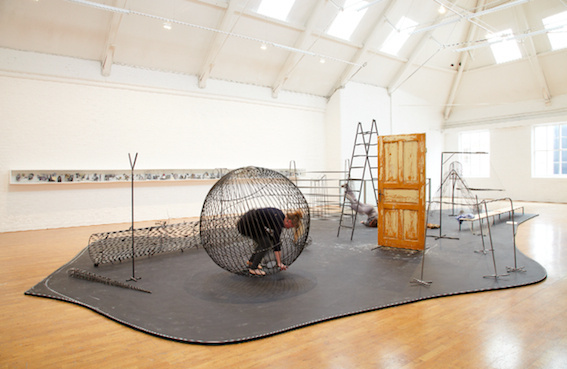 Her physical cages materialise the impediments to communication and movement that lead to a person’s failure to integrate within social systems. 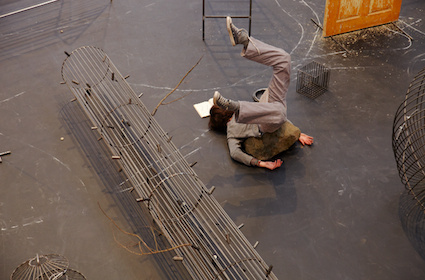 In the space, the performers’ mechanical and repetitive actions attempt to create meaning, to activate a voice that is continuously frustrated by the limitations of the props. Intermittently, the performers’ pace increases and becomes more agitated as they involve themselves with a selection of everyday objects, which leads to the slamming of doors and books and the uncanny sight of a body rolling itself inside a carpet. The playfulness and intriguing nature of these random outbursts systematically disrupts the quiet of the space, interrupting the tedium of the performers’ submissiveness to the rigid structures. During the 1960s and 70s, Basaglia led efforts to reform standards of psychiatric practice in Gorizia and Trieste mental hospitals, working towards their deinstitutionalisation by tearing down both the physical and psychological barriers that confined the patients, from the solid walls of the old buildings to the hierarchical relationships between clinicians and those in their care. In The Institution Denied, Basaglia explains that during this process of ‘overturning’ the asylum, patients no longer accepted being seen merely as objects, and occasionally disrupted their passive and submissive state by ‘a new aggressiveness’ that appeared indecipherable to others. We might identify a similar hostility in the momentary switch in Kotátková’s performers’ behaviour, which introduces accident, improvisation and rupture to the otherwise controlled environment of the gallery space. Basaglia’s thinking was aligned with concurrent discourses against the institutionalisation of the body, widely known as ‘anti-psychiatry’, which find in the asylum just another example of total institutions that control and administer subjectivities. Such interest in the management of the self is also present in many of Kotátková’s previous works, which have often reflected on what is normative within institutions such as psychiatric hospitals, schools or hospitals.6 Asylum (2013), her magnificent installation for the 2013 Venice Biennale,7 for example, staged a fragmented body trying to liberate itself from the architecture of confinement characteristic of mental institutions. 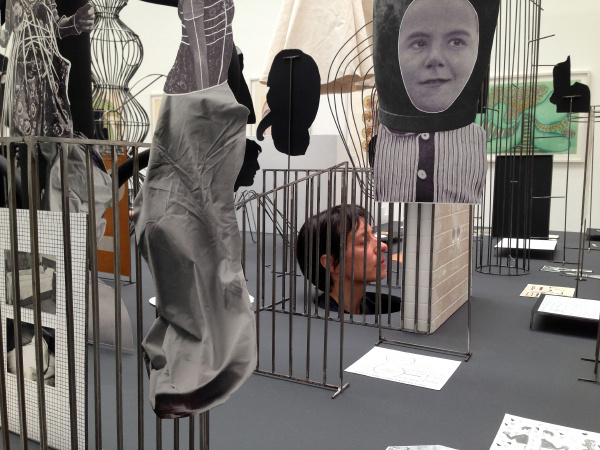 Based on Kotátková’s frequent research visits to the Bohnice psychiatric hospital in Prague, the work attempts to capture both the institutional constraints and the alternative modes of communication envisioned by the patients, with cut-out figures standing or appearing to float above the surface of a rectangular black pedestal, often restrained by metal bars and other architectural devices typical of institutional settings. In the words of the artist, ‘Asylum presents a collection of fears, anxieties, phobias and phantasmagoric visions of patients and children suffering from communication difficulties or struggling to fit within social structures, a chaotic archive of inner visions’.8 For an hour each day of the Biennale, performers’ hands and heads extruded discreetly from holes in the pedestal: the body, once again, trying to break free from isolation and extending itself towards an outside world. This performative element was informed by the artist’s own experiences within the hospital, where the apparent solitude of corridors and gardens was unsettled by anonymous eyes poking from peep-holes in the doors, or arms waving from the building’s windows. Thus body parts periodically coexist with the architectural segments and the fractured photographs furnishing the pedestal, proposing a fragmented body – both personal, within the characters’ inner worlds, and institutional, within regulated environments – as an alternative to the established order. At Modern Art Oxford, the motif of the fragmented body reappeared in connection not so much with a physical institution but with language as a corrective apparatus, with its fixed rules, often so alien to natural communication. Displayed within a long glass vitrine alongside the speech organ installation, a series of paper cut-outs suspended from strings functioned as an appendix to the performance. Reminiscent of Dadaist photomontage, this chaotic assemblage included jolly figures such as uninhibited acrobats, ballerinas and children at play, intermixed with eerie cut-ups of body parts – caged heads, covered mouths, tied legs, severed hands and watchful eyes – and constraining devices – straitjackets, bricked or barred windows and masks. The unsettling combination was intensified by knife marks scratching the surface of the photographs and the conspicuous presence of strings from which the figures hung hopelessly. By accepting fragmentation and chaos as a possible system, Kotátková’s animated installations and assemblages at Modern Art Oxford and the Venice Biennale enact the collapse of continuous narration so fiercely defended by the nervous lecturing scholar. As her characters strive to embrace the chaotic versus the normative, Kotátková is transformed into that performative narrator described in the lecture: a narrator that allows us to experience the failures, contradictions and artifices of her own attempts to recreate the world as an ordered whole. In doing so, Kotátková exposes the normative ‘armours’ that shape ordered communication, performing the task assigned by the scholar to today’s artist: ‘an art-form that accommodates the mess … and gives voice to the universal chaos’.